The PLA is organized into an administrative structure and an operational structure. Both of these are based on the PLA's officer personnel structure, which is composed of 15 grades and 10 ranks. 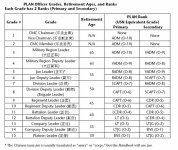 Therefore, a basic knowledge of the PLA's officer grade and rank structure is essential to understanding the organizational structure. 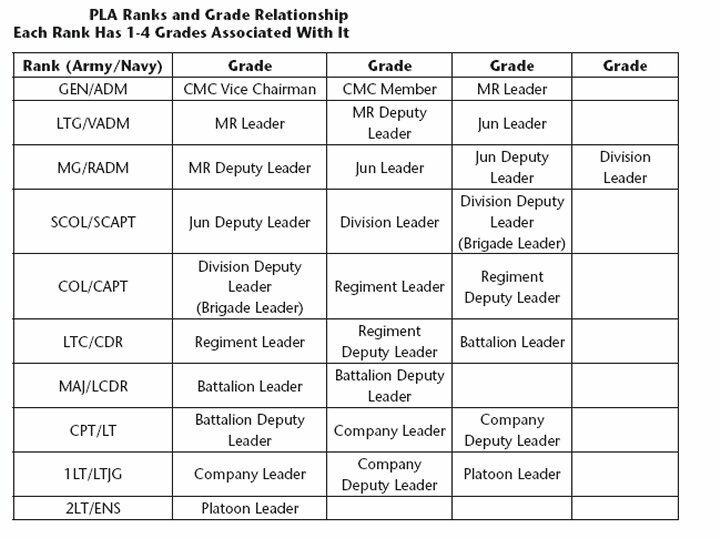 As of 2007, all PLA officers and organizations are assigned one of these 15 grades. The image below shows the current system with 10 ranks and 15 grades as it applies to the PLAN. The US military system, grades and ranks are synonymous. US military officers are assigned one of 10 ranks and each rank has an equal grade of O-1 to O-10 (i.e., a US Navy commander is an O-5). 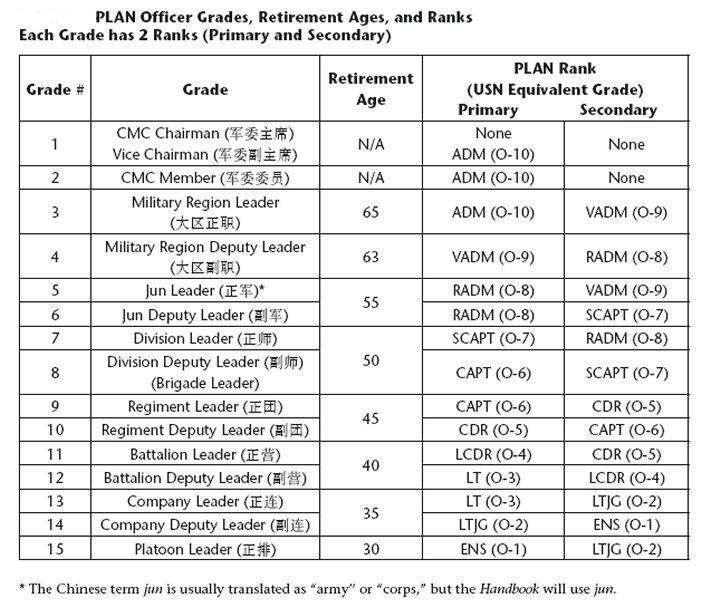 In 2007, The PLA also has 10 officer ranks, but it has 15 officer grades, which are identified by the type of organization and whether it is a leader or deputy leader position (i.e., division leader or division deputy leader). Each named grade has an associated number. However, when referring to officers or organizations, the PLA uses the name, not the number. For example, a division leader is not called a Grade-7 officer. Each grade has both a primary rank and a secondary rank. For example, a fleet commander can have the primary rank of vice admiral or the secondary rank of rear admiral. Furthermore, as shown in the figure below, each rank can have from one to four grades associated with it. For example, a PLA Navy commander can be assigned the grade of regiment leader, regiment deputy leader, or battalion leader. Within the PLA, the grade, not the rank, has always reflected authority and responsibility across service, branch, and organizational lines. Thus, although rank is a key indicator of position within the hierarchy of foreign militaries, grade is the key indicator within the PLA. One must make a clear distinction about what constitutes a "promotion" in the PLA. 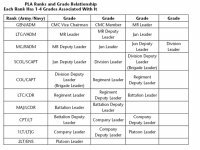 Within the PLA, promotions in grade are what count. Moving forward from one grade to the next is a promotion. For example, from a regiment leader to a division deputy leader is a grade promotion. Moving from one position to another in the same grade is a lateral transfer. For example, moving from the chief of staff to be a deputy commander in PLAN Headquarters is not a grade promotion, because both of these positions are MR deputy leaders. Furthermore, one should not equate a promotion in rank to a promotion in grade. For example, the commander and political officer at every level in the PLA's chain of command hold the same grade, but they often do not have the same rank. The reason for this is that officers must serve in a particular grade for a set period of time before they are promoted in rank. PLA regulations specify the time-in-rank and time-in-grade requirements for officers before they are promoted to the next rank and grade. For all ranks except second lieutenant to first lieutenant, the time-in-rank requirement is four years. However, the time-in-grade requirement is three years. Furthermore, in the PLA, time in service begins the first day as a cadet in an academy, not the day of commissioning upon graduation. As shown in the figure below, the promotion cycle for grades and ranks is not a 1:1 ratio. Military pay is calculated on the basis of time in rank, time in grade, and time in service. Unlike the US military, the PLA includes the three or four years served as an academy cadet in their total time in service. Finally, regulations regarding retirement ages are based on grade, not rank.